The UK company behind the McVitie's, Jaffa Cakes and Penguin brands has been bought by Turkish food group Yildiz Holdings for a reported £2bn. United Biscuits (UB) was put up for sale by its private equity owners Blackstone and PAI Partners. UB employs employs about 7,100 people, with 4,600 in the UK at sites including London, Manchester, Carlisle, Glasgow, Halifax and Liverpool. Yildiz owns Belgium's Godiva Chocolate and America's De Met's Candy Company. The company has no operations in the UK, but has a presence in the US, Middle East, North Africa, China, and Japan. America's Kellogg's is thought to have been among several firms interested in buying UB, whose other products include Twiglets and Mini Cheddars. Yildiz said it would look to drive UB's growth using its own global distribution network. Chairman Murat Ulker said: "We want to grow United Biscuits to be a global player as part of Yildiz. "This will include enhancing its position in the UK, where Yildiz currently has minimal presence, so we will continue to invest in the UK and Europe," he said. 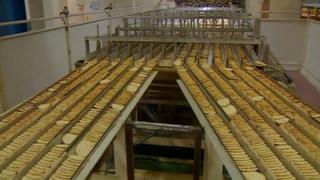 Although no sale price was disclosed in United Biscuits' statement, several reports said the figure was around £2bn. Lionel Assant, European head of private equity at Blackstone, said: "United Biscuits is a great business and has been an excellent investment for us. Yildiz is the best home for the company and will allow UB to fulfil its international growth ambitions."